The carefully considered coffee still flows at Café Velo on the corner of SW Sixth Avenue and Pine Street, a few flaps away from Little Bird on the bus mall. But instead of North African street food, the take-out case has a whole new perfume: wizardly fruit pies, handmade biscuits, and revelatory quiche. Lauretta Jean’s is in the house. Café Velo + Lauretta Jean’s opened Tuesday with an eye-popping selection of sweet and savory baked goods for breakfast or lunch: blackberry and golden raspberry pie, focused on the intensity of the tart-sweet berries, with barely a hint of sugar; chocolate cream sliders, delivering three kinds of single-origin chocolate and one cloud of whipped cream in three bites; delicate raspberry galettes; each pie, deep and bold in a beautifully crimped crust. And, of course, homemade ice cream…a taste of defiance on this suddenly-fall morning. 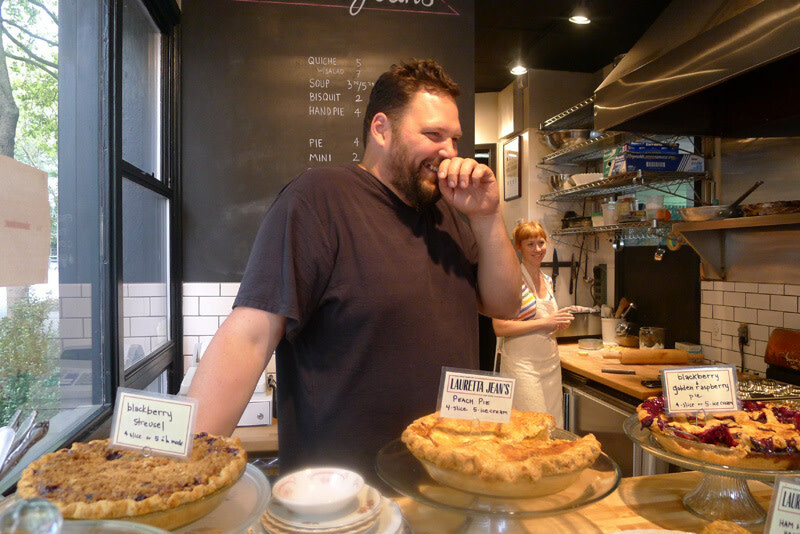 Behind a rolling pin that could frighten a bouncer, 31-year-old Kate McMillen is a thinking person’s pie maker, serving up American classics with careful twists and serious all-butter crusts. Her secret formula, gleaned from her Idaho grandmother and showcasing Oregon fruit at its peak, has made Lauretta Jean’s a micro-baking star at the Portland Farmer’s Market, served with impossible laughs and cheer by her fiancé Noah Cable. (Read our story, The Rise of the Small). McMillen’s $2 sliders have drawn a cult following on their own, and the new shop will carry a selection of flavors, like butterscotch, coconut, and lime. But her secret talent is for quiche. One bite and you’ll realize you’ve never eaten a good one before. In McMillen’s hands, they are deep-dish and delicate, build on a super-flaky, thyme-flavored crust, organic farm eggs, a bump of real cream, and a gorgeous surface of mahogany char. About three flavors will be served daily at $5 a slice, and you don’t want to miss the versions starring Otto’s smoky bacon or Tails and Trotter’s chorizo. Unlike the farmer’s market, where McMillen hauls her baked goods from home to reheat in a Camp Chef stove, the new location allows her to pull other ideas from a real oven. On opening day, that meant fantastic biscuits holding everything you could ask for: exquisitely light, a big butter flavor, and plenty of bronzed crispy-crunch on top. One the side: fine fresh jam for smearing. Get them in the morning while they’re warm. Daily soup is also on the menu, along with a small collection of savory hand pies. 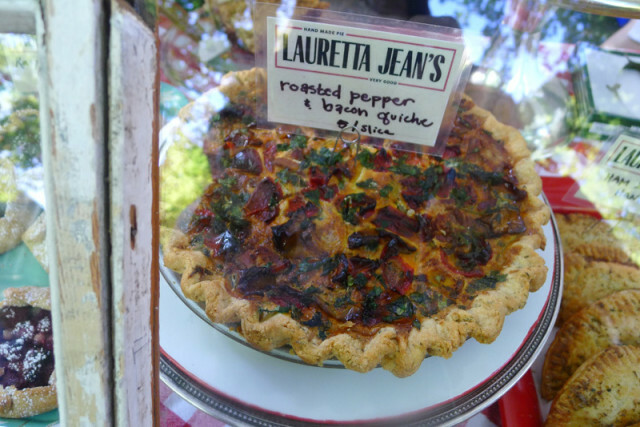 But pies are still the beating heart of Lauretta Jean’s. A brick-and-mortar will allow McMillen to climb to the next level while creating a formal headquarters, at last, for her terrific holiday pies. Fall will bring a new wave of flavors, as McMillen tears into pears, quince, figs, and squash. Slices can be had for $4.